Hangman Pro is a modern take on the classic hangman word guessing game we all played when we were kids. It features colorful, non-violent graphics, digitized sounds, dozens of built-in word categories, thousands of words, unlimited lists of your own words, hints, timed games, photo fun, and much more. Hangman Pro is secretly-educational. It’s played for fun, but you can’t help learning. Included in Hangman Pro is a new Knowledge Area. This area will include information associated with the guessed word or phrase. If the word chosen is from the States or Countries category, for example, the Knowledge Area will show the capital of the State or Country. If the category is Authors or Composers, the knowledge area will show facts about, or famous works of, the author or composer. You can also make your own lists (unlimited in number) and include your own associated information. There are dozens of categories, guaranteed to include something for everyone. From Monsters and Dinosaurs to Star Trek and Television Shows, from Animals and Birds to Colors and Cities, from Fruits and Vegetables to Presidents and Vice-Presidents, from Rock and Roll to Opera and Musical Instruments. And literally dozens more! Hangman Pro also offers full support for what’s often known as accented characters. Hangman Pro supports the entry and display of words in many languages, including Danish, Dutch, English, Finnish, Flemish, French, German, Italian, Norwegian, Spanish and Swedish. 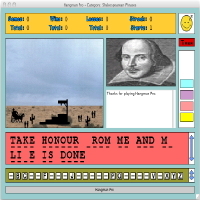 Hangman Pro makes learning vocabulary more fun than ever before. Perpetuum mobile realizes continually moving and rotating balls. With sound-output originates such a music-piece that proceeds from start until end in equally swift speed. Up to 500 balls jump in an area around. The ball-movement can take place with gravity dynamically. As spectator-position can be selected the screen, the room-middle, a ball or an elevator. Hereby special visual and acoustic effects come to the validity. The user can plan diverse attitudes over six dialog-sides and save these into a file. The further can be started a small reaction-game and a screensaver. For Windows CE is offered Perpetuum mobile for different processors, that were not tested all by us. Please test Perpetuum mobile with our test-version on your CE-device therefore beforehand. Hangman Pro is a modern take on the classic hangman word guessing game we all played when we were kids. It features colorful, non-violent graphics, digitized sounds, dozens of built-in word categories, thousands of words, unlimited lists of your own words, hints and much more. Hangman Pro is secretly-educational. It’s played for fun, but you can’t help learning. Included in Hangman Pro is a new Knowledge Area. This area will include information associated with the guessed word or phrase. If the word chosen is from the States or Countries category, for example, the Knowledge Area will show the capital of the State or Country. If the category is Authors or Composers, the knowledge area will show facts about, or famous works of, the author or composer. You can also make your own lists (unlimited in number) and include your own associated information. There are dozens of categories, guaranteed to include something for everyone. From Monsters and Dinosaurs to Star Trek and Television Shows, from Animals and Birds to Colors and Cities, from Fruits and Vegetables to Presidents and Vice-Presidents, from Rock and Roll to Opera and Musical Instruments. And literally dozens more! Hang3001 includes Multi-Level Winning Streak Score Boards, allowing students and family members alike to keep track of winning streaks. 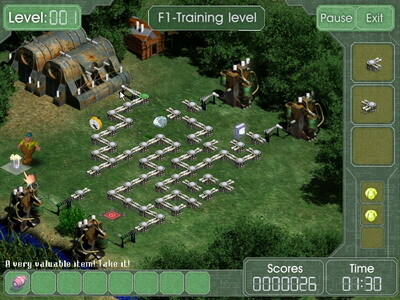 And, best of all, separate score boards are kept for each difficulty level, so users can compete against users choosing the same difficulty level. Hangman Pro also offers full support for what’s often known as accented characters. Hangman Pro supports the entry and display of words in many languages, including Danish, Dutch, English, Finnish, Flemish, French, German, Italian, Norwegian, Spanish and Swedish. Hangman Pro makes learning vocabulary more fun than ever before. 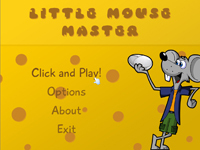 Little Mouse Master is designed to teach children how to use a computer mouse for the first time. Simply guide the child on using the mouse and watch the pictures come to life with animations and sounds! 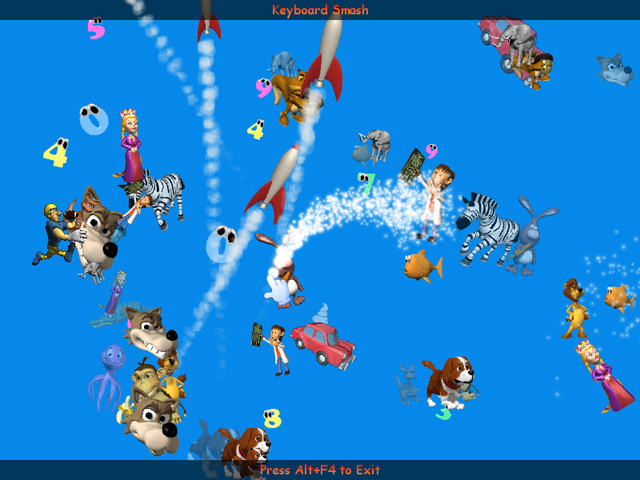 Kids will enjoy clicking on the right objects and be encouarged to move the mouse cursor in the right direction. Parents and teachers will see a difference in very little time as they watch the child become a little mouse master! Keyboard Smash is designed to allow young children to play for the first time with a keyboard and mouse while at the same time not endangering the operating system and its file contents of the computer. Designed to stimulate children by linking actual keyboard letters to matching objects and sounds Keyboard Smash brings a fun new activity for youngsters to enjoy! Traditionally parents would have to monitor the computer usage since children can inadvertently perform undesired tasks such as rebooting the PC, delete files, start other programs, crash the operating system, etc? Keyboard Smash eliminates all of there issues and more by isolating itself from the reset of the operating system and in a sense creating a safe environment for young ones to have fun in! A software helps your kids get to know the things by pictures and keeps your computer safe from random strikes on keyboard. 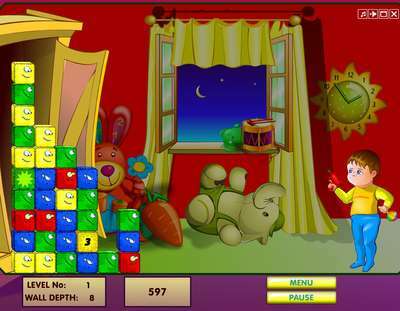 It&apos;s a kids educational game, which enables you to give your children vared picture lessons, and locks your keyboard . Babies love to imitate their parents pounding keyboard from 6 months old. It should be encouraged because it helps to enhance their coordinative ability and improve their self-confidence. But these aimless strikes can activate unwanted programs, change the computer settings or delete important files. Baby Kids Keyboard Lets your curious baby pound the keyboard freely and safely. With their growing up, the babies need to learn more things, such as numbers, alphabet, family members, all different kinds of sounds and so on. 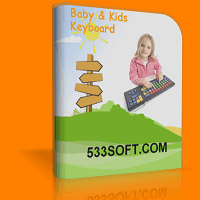 This software is a very good teacher for your babies and kids. Children can learn a lot from the games the software provide. For every tap of the keys or mouse, the child is rewarded with a amazing images and related sound effects. Meanwhile, this software allows parents to add family album, edit notes and record your own sound. Your kids will be very suprised to see your photo on the screen or hear “mom and daddy” after one tap. With this software, kids can learn more quickly and parents will have a few minutes to rest. People have been using electricity in their life for a long time. They use it at home and in the work. Electricity works instead men. Nobody is surprised that computers and robots work at plants. What would our life have been if people had never invented electricity? It’s even difficult to imagine now. The work of the man who assembles power lines is hard and difficult. And it is not easy to maintain them. That is a job of an electric. Do You think it is not interesting? Excuse me, but You are not quite right! Try to feel all the delicacy of being an electric. Especially when You’ve got such a difficult task. The task is to assemble all power lines , damaged by robots which want to destroy all the mankind. Although not all the robots turned against the mankind but majority of them promote the active destruction of the united electric nets of the world! They blow up power lines in different places. Don’t let them do it! You have to connect all broken chains of power line in time. You have done it but consumption station is off that is why the chain is broken. You have to switch it on by pushing red buttons and gathering tools of activation. You’ll recognize them because little red arrows always point at them. The are a large number of prizes in the game? They help You during the game. Some of them help You to connect the elements. Through “The Door” You can go to the next level straight away. If You use the elements which hold up the liquid and Money Pump, You’ll gel the maximum score! You can also collect precious stones, every three precious stones You get a freestyle prize. But you should careful too, beware of catches! Every level is more interesting then the previous one. Every level has its own new prize element. In all there are 100 levels in the game! The game is very beautiful and interesting! The prize is so small that don’t even think just buy it and all! Enjoy Your self playing Electro Master! There is a great tidying up in the flat: all the windows should be washed, dirty clothes should be laundered and all the toys are to be put in order and in their proper places. Tommy considers that he is rather old, that is why he promises to parents to clean his room himself. But what?s up with those colored cubes? They got out of hand and won?t stay on their places. Help small Tommy shoot down all of them and keep the room in perfect order!